Exhibitor move-in: Move-in will be all day Monday, October 31, and Tuesday, November 1. Sponsorship/Promotions: Experience the value of sponsorship and extend the value of your exhibit. Contact the WJTA-IMCA office or check back soon for details. The WJTA-IMCA 2016 group hotels have been announced: Renaissance New Orleans Pere Marquette and Hilton Garden Inn Convention Center. For all the details and to make your reservations, click here. If you are traveling internationally, be sure to make your arrangements early. 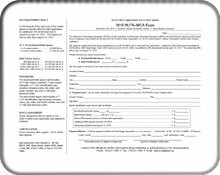 If you require a letter of invitation for visa purposes, contact Peter Wright in the WJTA-IMCA office.